I read this article and respect his educated opinion, but it's just that to me, an opinion. I prefer my own. now ask yourself this question... where is all this free publicity coming from? a God-theory, it still is welcome. as to how the universe might work. the existence of the universe per se. his job as a physicist. for example, a fashion designer. picture of the machine as a whole. one needs to believe in is sound – who cares. Religions are not seeking scientific truths. religions are here to stay. "Because there is a law such as gravity, the universe can and will create itself from nothing," he writes. "Spontaneous creation is the reason there is something rather than nothing, why the universe exists, why we exist". George Orwell writes, "There are some ideas so preposterous that only an intellectual could believe them." I believe the same can be true of a Mensa genius. 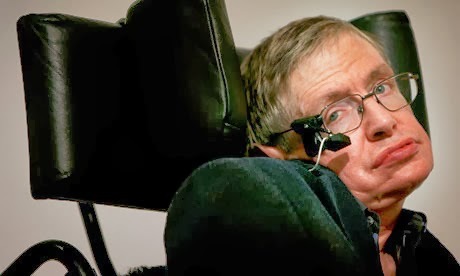 Hawking writes "Because 'there is' a law such as gravity... ". Yes, well, from where did it come? Did that law, that manifestation of physics, create itself? Hawking never impressed me. I personally know people such as him. While they do think on a plain of reasoning well beyond the average individual's capability, as a natural manifestation of their higher intelligence, this is not a sequitur, which gives them a corner on the market, when it comes to either truth or common sense. “Yes, well, from where did it come? Did that law, that manifestation of physics, create itself?" This is “The Question” and I doubt whether science would ever produce a satisfying answer to. It is said science, aspires, like theology used to, to explain absolutely everything. Yet, how can you cross this enormous gulf between non-existence and existence? We’ve come a long way. Science has told us so much about our world! We now understand, more or less, what reality is made of and what forces push and pull the stuff of existence to and fro. Scientists have also constructed a plausible, empirically founded narrative of the history of the cosmos and of life on Earth. To my mind, we still need further scientific investigation of our universe to be able to solve all mysteries. Is there an odds-on chance that the natural law of gravity might have come from “Nothing”? Could it be conceivable that “something” might have sprung from “nothing”? Try to ponder on the state of affairs of “Nothing” as something even larger and more surprising than the state of “Something”. I have read somewhere about “quantum fluctuation” -- physicists such as the legendary John Wheeler proposed that, according to the probabilistic dictates of quantum field theory, even an apparently perfect vacuum seethes with particles and antiparticles popping into and out of existence. In 1990, the Russian physicist Andrei Linde proposed that our entire cosmos, as well as an infinite number of other universes, might have sprung from a primordial “quantum fluctuation.” This is ultimately strange but engrossing. In the fabric of reality, it is said, these quantum fluctuations in the void actually seem to drive "things" into existence, almost as if "nothingness" were an elevated state of tension that demands resolution via the creation of "stuff". This cannot help but reinforce the purely philosophical notion that it is possible that "nothingness" may also have a certain improbability about it. People have the right to define their philosophical and religious leanings on their own terms. In general, people start off with a belief and a prejudice— we all do. And the job of science is to set that aside to get to the truth. But people should not deny science or truth or reality when they choose a belief system. It is simple logic: mainstream media does bias what research is shown to the mainstream public. Naturally they won't market a radical breakthrough/idea that might not sell. Scientific breakthroughs will seldom be cost free. No one can produce a revolutionary discovery/idea and do it without some sort of financial return. They expect to get paid. They need that money to continue with their pursuits. What determines its success, in the long term, is how the general public welcomes this. If it works, the more we will hear about it. As far as I can understand, there is no overriding committee that decides what the public is allowed to know. How else do you think the general public finds out about scientific advancements, anyway? By word of mouth alone? The media is the way we get our information about nearly everything, even the nuttiest ideas are spread via the media. Most of what you and I know or think we know has been dispensed by the media in one form or another. Then again, that much of what we discover from these and that which we choose to believe may serve to be a sequence of invented remedies to allay our mind from its terrible and chronic pain of intellectual anxiety.